AGE, A GROWING list of ailments, and a mercenary and meaningless artworld have all conspired to limit the range of my comings and goings to art venues for the past several years — I was simply left cold by so much of what I saw, that giving up on ART TIMES had crossed my mind more than once. But then what? Who’d hire an 81-year old scribbler who can barely get around anymore? Thus, my almost daily mantra — until recently! I was roused from my morose musings a few weeks ago by a call from my niece Kathy King informing me that her daughter Kaitlyn (“Kate”, my grandniece)) had a piece of her artwork chosen to represent her High School (Onteora School District in upstate New York) at an art association/gallery/museum (the venerable, nearly 100-year-old Woodstock Art Association Museum (WAAM)) student exhibition in nearby Woodstock. Although I attempted several times to go and see it, I did get to see the photos that my partner, Cornelia Seckel, took of the show, as well as a list of the 27 student-participants. As far as I could tell, the exhibit seemed to be colorful, displaying a variety of mediums — from graphics, paintings and mosaics to ceramics — and ‘professionally’ hung. Masterpieces? Probably not to the world. To the students and their parents? Perhaps. But whether or not they would go down in history as such, they were good — and obviously presentable otherwise they would not have been chosen by their teachers and given the valuable “wall space” of WAAM. In addition to the fact that my grandniece was part of it, what piqued my interest was the fact that it was a student exhibition. For a kid who never had art/music classes in my school-years (even the propensity for drawing was discouraged by nuns at the Parochial school I attended – along with heavy doses of “learn a trade” from my parents when they caught me copying from the comic strips of the time) school and art — especially teens and art — intrigued me and it soon became clear to me that the idea had been — and was — very much alive and thriving. Art is encouraged, taught, and also ‘honored’ at times. I should have had some inkling when I think about it (instead of batting my head — and sensibilities — against what I see as an overwhelming sea of ‘stuff’ blotting out “art” — a term, incidentally, that can no longer boast a definition anymore). In fact, Arthur Danto (among others) has already informed us that “art is dead.” Period. So I’ve been burying myself in my study for, lo, these many months and just turning the whole thing off. But, as I said, I should have had the inkling and remembered Kamryn Delmonte, a 15-year-old who visited me just about two years ago. Kamryn, the daughter of my phlebotomist Rebecca Delmonte, used to have her drawings tacked up in Rebecca’s ‘booth’ at the Lab where she periodically drew my blood. I remember the quality of the draftsmanship (draftwomanship ?) of the drawings and telling her Mom about it. When I asked how old her daughter was, she said, “Thirteen.” Wow! Two years later, she visited me and gifted me with a drawing which still hangs in my study. Kamryn, I had learned later, earned a scholarship while attending high school for a year’s study at the Woodstock School of Art, another venerable Woodstock art establishment that I have since learned have scholarship programs (funded by the Thompson Family Foundation and initiated by the Saugerties High School) for both high school and college level students as well as a Summer Art Adventure Program for kids aged 7-12. My neighbor Althea Meneses (an artist herself) tells me that even her two girls, Anya and Jade, aged 7 and 8 (1st & 2nd Grade, respectively) in Saugerties’ Mount Marion Elementary School, have art lessons! And, it’s not only schools that are promoting ‘teenart’! 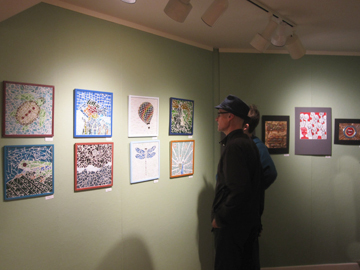 Fall for Art, an art-exhibiting organization of The Jewish Federation of Ulster County, has recently begun out-reaching to local High School seniors to participation in exhibiting teacher-chosen works (two pieces) in their annual Fall for Art exhibitions. A chance to be among some of the finest area artists who are yearly ‘juried’ in! This year, twelve (12) schools have agreed to participate, and 3 students already chosen to show this Fall. And further: LeAp (Learning through an Expanded Arts Program) of New York City, in cooperation with NYC Parks & Recreation,has invited students from the Bronx, Brooklyn, Manhattan, Queens, and Staten Island to participate in a city-wide first-of-its-kind exhibition themed “A View from the Lunchroom: Students Bringing Issues to the Table” that “kicked-off” at Union Square Park on May 20th. Envisioned by Alexandra Leff, Director of LeAp’s Public Art Program, the exhibition is meant to encourage teens to address such social issues as racism, drug addiction, teen pregnancy, religious intolerance, and bullying. Finally, I should keep in mind such individual artists such as my friend Susan Hope Fogel (among who knows how many?) who offers private art lessons to youngsters (and presently doing just that to her students over in Cape Cod. Bravo! to all these parents, teachers, and organizations (and many others I’ve failed to mention, I am sure) for promoting creativity in kids. Out of it all will surely be a welcome return to the neglected concept of ‘fine art’. Who knows — maybe it will stir me from my solitary meditations? You are currently browsing the Raymond J. Steiner's Blog blog archives for June, 2014.